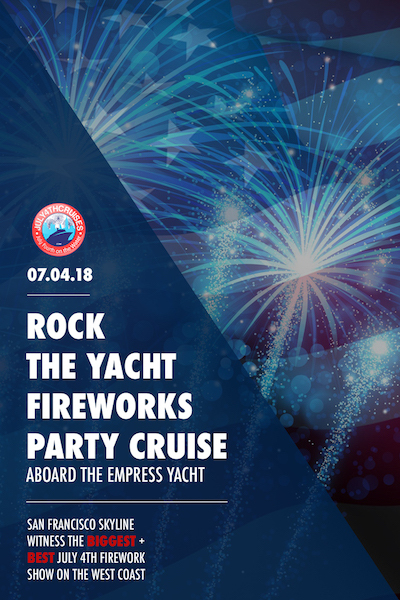 Celebrate July 4th in San Francisco with a party experience on the seas aboard the Empress Yacht. Sail through the Bay Area and take in the sights while you enjoy music and drinks all night. This San Francisco July 4th cruise is going to end off the night with a view of the fireworks right from your yacht! There’s no better way to celebrate your Fourth with friends this year than on our San Francisco July 4th cruise. The Empress Yacht is a beautiful 90 ft. luxury yacht built to sail you in comfort. Get on this great yacht and take in the views of San Francisco. While you party your July 4th away, you will enjoy views of the Golden Gate Bridge, the Bay Bridge, Treasure Island and more! Enjoy the sights of San Fran and get ready to dance the night away. This San Francisco July 4th cruise will have you and your friends moving your bodies to all of this year’s hits. We will have a live DJ on board mixing up all of the hits of the year as you wait to catch a view of the fireworks. Dance to the Top 40, Pop, Dance, and Hip-Hop hits while the city skyline passes you by. Party on the dance floor and make sure you enjoy complimentary hors d’oeurves served onboard. Not only will this San Francisco July 4th cruise be serving up bites, but also drinks all night. Get your favorite drinks pouring with the three-hour premium open bar and head to the outer observation decks to enjoy the fireworks. Once the fireworks launch into the night sky, you will enjoy a wonderful view right from the Empress Yacht! If you miss out on this July 4th celebration on the seas then you definitely will regret it. Book your tickets aboard our San Francisco July 4th cruise today and party your Fourth away on the seas!